Sous Vide Cooking is my latest obsession. I still love my Instant Pot but nothing beats the Sous Vide. The Sous Vide is an Immersion Circulator cooker. Everything I have tested out has turned out perfect. There is no guessing and no work. Simply season and let it cook walk away all the guess work is taken out. I made the most amazing TacoBurgers done to the perfect Medium Well and my Starbucks Copycat Egg bites have been a huge hit. Sous-vide (/suːˈviːd/; French for ‘under vacuum’) is a method of cooking in which food is sealed in a vacuum-sealed plastic pouch then placed in a water bath or in a temperature-controlled steam environment for longer than normal cooking times (usually 1 to 7 hours, up to 48 or more in some select cases) at an accurately regulated temperature much lower than normally used for cooking, typically around 55 to 60 °C (131 to 140 °F) for meat and higher for vegetables. The intent is to cook the item evenly, ensuring that the inside is properly cooked without overcooking the outside, and retain moisture. 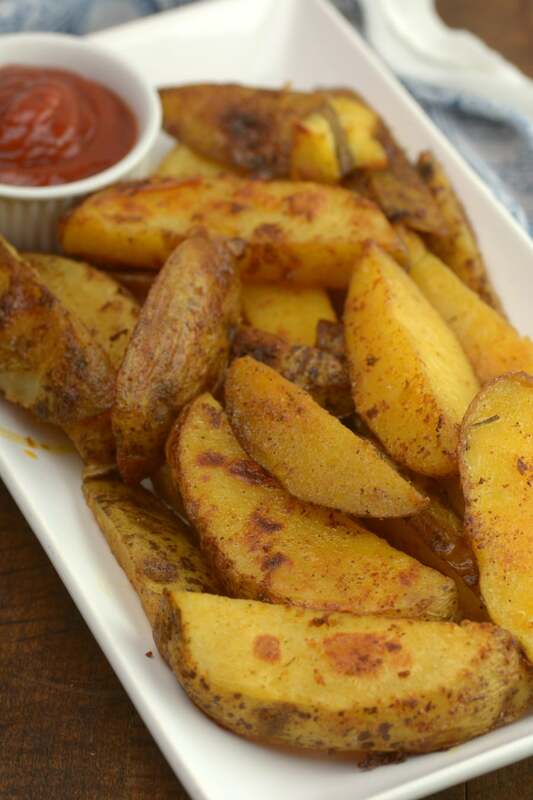 Knock Your Socks off Sous Vide Steak Fries are spicy and crispy with a perfectly soft center. 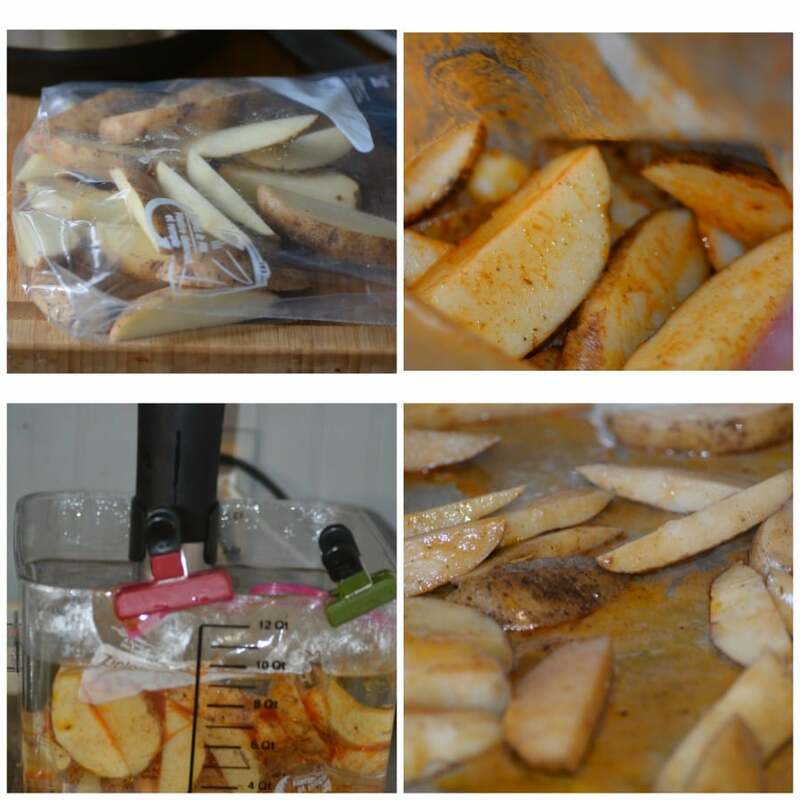 Restaurant quality steak fries infused with seasons done right at home. Directions: Place your Sous Vide on 190 degrees. Cut your potatoes in half and lengthwise. Melt butter in the microwave and mix together seasonings. Place potatoes in a zip lock bag and pour over seasons. Make sure all potatoes are well coated. Lower bag into your sous vide, removing air and close bag. Let cook for 90 minutes. Remove place on a baking pan under the broiler for 2-3 minutes on each side. Serve. A Sous Vide is not necessarily an Immersion Circulator, but Immersion Circulators are used for Sous Vide. I have a Sous Vide Supreme that does not have any immersion circulator, but it works fine for SV for smaller cooks. Technicalities aside, I am looking forward to replicating your Sous Vide Steak Fries. Just got my Sous Vide! These were the first things I made. They were delicious! Now if I can figure out how to do the meat and potatoes together I’d be loving it. I put them under the broiler about half way through the pork chops cooking in the bath so I had to reheat them while searing the pork chops. They were still very good though. I’ll definitely be making them again.